There is no way anyone can have a website about the history of the Treeing Walker breed and not have a page or section on Lester Nance and his impact and contribution he had on this great breed we all call Treeing Walker. Who named the Treeing Walker? LESTER NANCE. Who was the first to get the Treeing Walker registered? LESTER NANCE Who kept the fires burnig with Dr. Fuhrman of UKC to get the Treeing Walker registered with UKC? LESTER NANCE. Who owned the first Treeing Walker World Champion? LESTER NANCE. A person could go on and on about the firsts that was brought about by a man from Indiana named Lester Nance. Today with the nice trucks, lights, tracking devices, good highways, cell phones, hunts within reasonable driving distances almost every weekend, and all the other things that we take for granted in our sport today it is easy to forget it use to be harder. Think of a time when most any truck was a farm truck and that was what it was used for. A time when most hunters didn't have a truck and used their car or had a trailer to pull with their car. It was a carbide light and for the bright light you had a big D cell flashlight. The big deal came when they came out with a charger for the batteries so we wouldn't have to buy so many batteries during the year. If you were on the road and you wanted or needed to make a phone call you had to find a phone booth with a pay phone. No calling cards back then. Either you put the money in the phone or called collect. You didn't have the interstate highways like we do today. Most of the traveling was on two lane roads and highways. Most of the people going to the hunts and shows once they got started wasn't doing it for the money, but to be able to compete and see who had the best hound. Also to make new friends. Many friendships came into being from people meeting other people at these hunts they traveled a great distance every weekend to attend. These people loved to coonhunt, the competition events grew out of the love for this sport called coonhunting. It wasn't easy back then but these men did it because they loved it, not for the money but for a love of the sport. Lester Nance became interested in Walkers when he bought White River King as an 8 month old puppy. King was born in 1932. 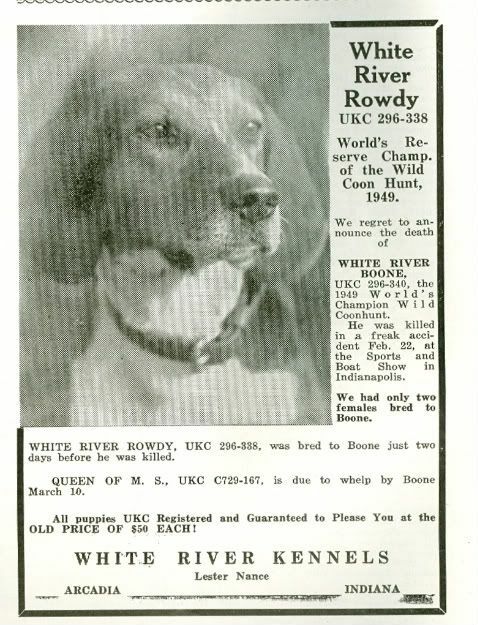 With White River King as the fountain head for his line of dogs, Mr. Nance began looking around by 1942 for a place to start a new breed registry for his line of dogs. He decided that since they were from the Walker Foxhound breeding and the Walker name was respected among foxhound people he would call them TREEING WALKERS. After inquiring from other types or hounds and sporting dog people Mr Nance started making contacts. He first contacted A.K.C. (American Kennel Club), and got a nice letter back stating they were not interested in starting a new breed registry. Mr. Nance then went to U.K.C. (United Kennel Club). He got the same reply. "We're not interested in any new stud files". Mr. Nance keep the fires burning with Dr. Fuhrman, the President of UKC at the time, but he couldn't get anything positive started. Mr. Nance then wrote Mr. Walker, the man behind FULL CRY magazine, with his ideas and Mr. Nance was met with more consideration then previous contacts with other registries. After corresponding for some time with Mr. Walker of Full Cry a Treeing Walker Registry was finally started with Full Cry Kennel Club and recorded as Treeing Walkers. 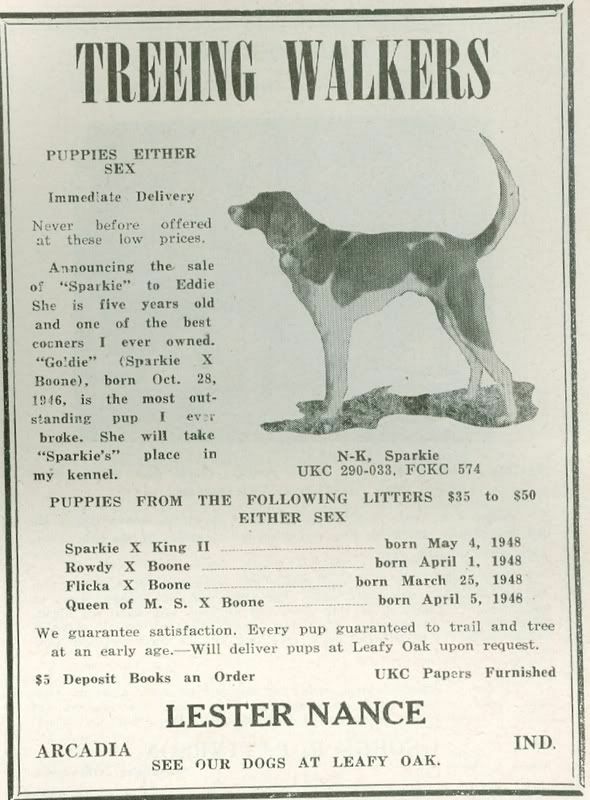 The Full Cry Kennel Club Registry was started in December, 1940. Mr. Walker started the first Treeing Walker registry prior to May, 1943. White River King F.C.K.C. #374 was the first Treeing Walker ever recorded. 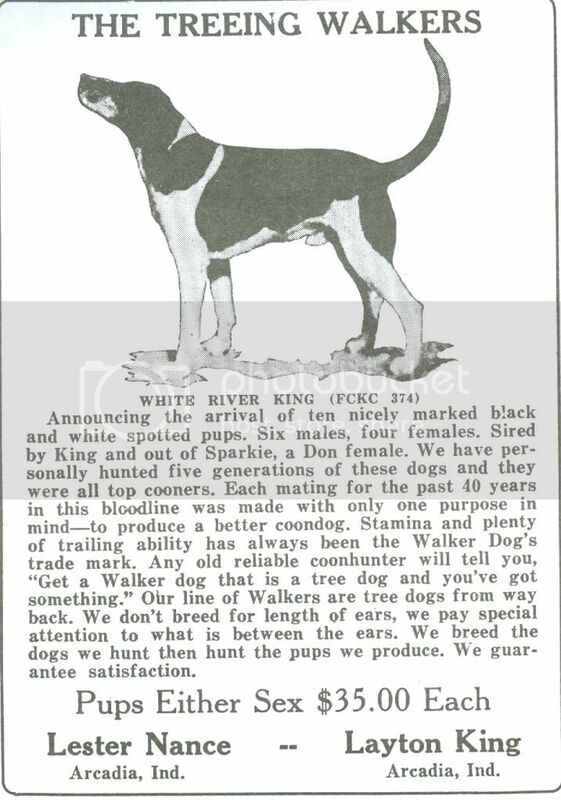 In the Jully 1944 issue of FULL CRY was the first ad to advertise the breed, TREEING WALKER. It was more than two years later before U.K.C. first recorded English Coohnound (Walker Treeing) and it was not until 1978 that U.K.C. finally gave the Treeing Walker coonhounds back the original name that Lester Nance gave them, TREEING WALKERS.